Like many lessons from history, it takes cross-disciplinary thinking and rule breaking to solve new problems for a new world. The London tube moves more than 3 million people a day across a complicated system with very little hitch. Few transport types can claim such success in a confined space. All subways are generally successful because they use maps that break nearly all understood mapping conventions. It took an unconventional approach and much rule breaking before people were equiped properly to deal with a new context. In the talk, Bierut explains that while existing maps failed to help tube riders, it took Harry Beck, an electrical engineer and not cartographer, to empathise with the actual situation to solve a major problem. Beck realised that existing map rules and perceived wisdom about what maps should provide needed to be significantly challenged if this new situation was to be resolved. What was important to travellers in older transport systems, like landmarks, scale, coordinates, and positioning, were less or not important in this new context. 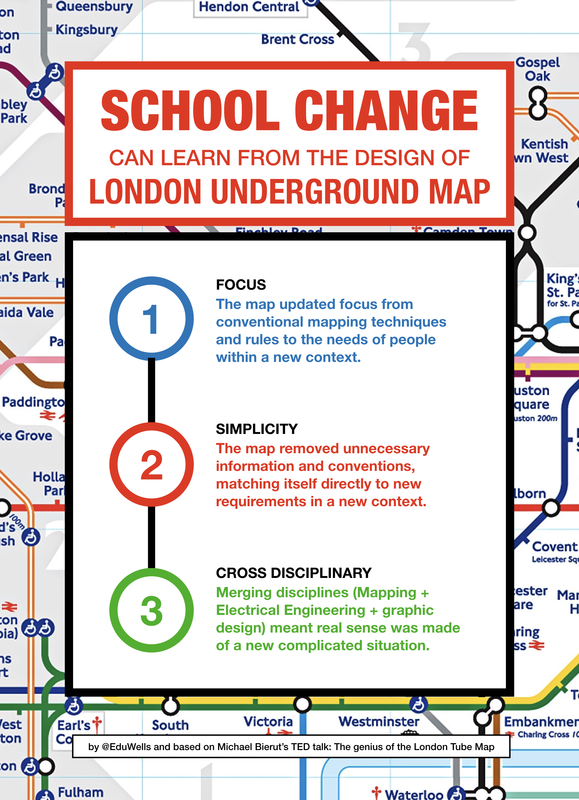 A map for school change? Focus: Educators and school leaders need to display awareness in their decision making of the current challenges facing young people and not continue working on previously applied wisdom and guidelines about what school should be. Simplicity: Don’t let historically held beliefs and priorities clutter your situation. Work with the full school community to remove unnecessary material. Cross-disciplinary: True sense of the world can only be made in cross-disciplinary situations. Let’s be fair to children and allow them to see things in context and stop the repetition in existing factory schooling. I hope this helps some educators build a stronger argument for how to approach school change.